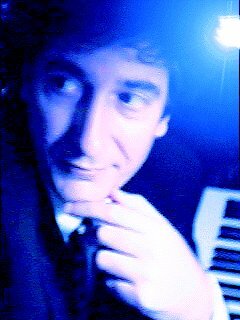 First, the simple facts: Stan Ridgway recently completed a side project, an album called The Way I Feel Today: Crooning The Classics. It's a collection of nineteen standards of songs from the 30's and 40's. It was made available for sale in mid-October of 1998. As of this writing (a month later), there are still copies available for purchase through ridgwaymusic@attbi.com. Each copy was $25, plus $2 postage/handling for delivery inside the US, and $5 postage/handling for delivery outside the US. All prices in US dollars. These days, it's available at live shows and through CD Baby for the low low price of $15. Buy two, they're swell! With this single CD, Stan multiplies fourfold the number of standards he's ever recorded. Trivia question time: name all the covers Stan has recorded that are available on CD, not counting The Way I Feel Today. Hint: there are seven. The answer is here. I was going to write a review of this wonderful CD, but I figured you should make up your own mind. With the gracious permission of Mr. Ridgway himself, I've sampled three full tracks and six excerpts to give you the flavor of this wonderful CD. All samples are MP3 files, and they are virtually CD quality (stereo, 128k/sec). To listen to 'em, you'll need an MP3 player, a special piece of software that turns MP3 files back into sound. They're easy to use; they work just like little CD players, except they play files. Where can you get one? Head to http://www.mp3.com/ and poke around. They've got 'em for all platforms. If you're a Windows user, WinAmp is a good choice. I haven't used any MP3 players on other platforms; feel free to send me mail and recommend one if you find one that works well for you and I'll mention it on the site. New for 2004! Stan has graciously shared these four previously-unreleased additional tracks as high-quality MP3s! Download 'em and share 'em with everyone you know. Produced by Robert McNeely, Pietra Wextun, Bill Noland, and Stan Ridgway. A Hi-Fi / Stereo Impala Digital Limited Release. Many heartfelt thanks to the very talented musicians that contributed to this recording. For my parents Stan and Connie. This recording is dedicated to the writers and original performers of these songs. Long may they sing.